It’s February. If you live anywhere like I do, you are embracing some winter snow, perhaps some cold winter temperatures, and may be feeling a little cooped up on the inside. A glass of wine probably doesn’t sound too bad right about now! While Valentine’s Day is often regarded as the “Hallmark Holiday,” I also like to embrace it as a holiday to consume some fun wines. Wines offer an opportunity to “create a moment” by celebrating every day achievements and embracing holidays. What better way to document such a loving holiday than with a bottle of wine? Over the years, whether celebrating with friends or a loved one, I’ve managed to integrate fun and interesting wines into Valentine’s Day. And you can, too! Whether you are looking for something “romantic” or want something unique to try, I have a few wine suggestions for you. 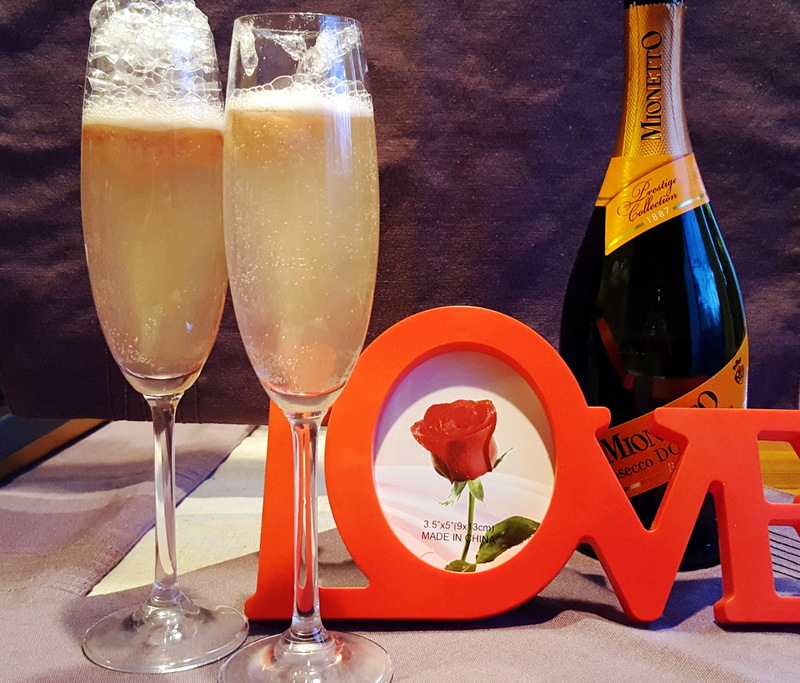 Nothing says “celebratory moment” or “romance” like a bottle of sparkling wine. Sure, you can opt for the expensive Champagne. Now is a great time to splurge on those more expensive bottles you have been wanting to try. I had two Champagnes recently that were overly enjoyable and that I would spend money on again: Perrier-Jouët Grand Brut (about $50 per bottle) and Beau Joie Brut (about $120 per bottle). Beau Joie offers a lovely wine and an impressive copper exterior shell on the bottle. If you would like a nice bottle of Champagne, but want a slightly lower price point, my go-to Champagne is Veuve Clicoquot, which retails around $50 per bottle. Not only do I love the story of the “widow winemaker,” but I also love the wine. It has all of the essence of Champagne: warmed bread biscuits, slightly yeasty characteristics, all hugged in a vibrant citrus and floral base. 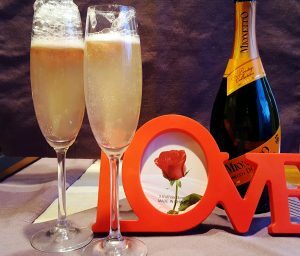 If you’d like to go for something a bit more “fun,” I am a huge Prosecco fan during Valentine’s day. These sparkling wines are fruitier than their Champagne cousins. Plus, they are the perfect base for adding creative embellishments like ripe red raspberries, strawberries, or blackberries. If you want a touch of sweetness, I suggest pouring Prosecco over your favorite sorbet flavor! It goes without saying that a case (12 bottes) of rosés are the perfect substitute for a dozen roses! Well, I find this to be lovely Valentine’s Day gift! In all seriousness, now is a great time to drink rosés, as there are a lot of good ones on the market. If you have caught my last blog posts, one of my favorite local rosés is the Dry Rosé by Pinnacle Ridge Winery (PA). I love the strong strawberry flavor, the soft mouthfeel, and the overall quaffable nature of this wine. Plus, you cannot beat the $14 price point. Or, opt for their Brut Rosé bubbly! If You Can’t Buy Flowers, How About a Wine that Smells Deliciously Floral? The thought of an aromatically intense Resling, Gewürztraminer (Gewüz) or Traminette wine over a lovely candlelit dinner sounds delightful, doesn’t it? Many of these wine will be slightly sweet to intensely sweet. If you are looking for something specific, don’t forget to ask someone at the wine store for their suggestions. I love German Rieslings and Gewürztraminers over this time of year. The aromatics often remind me that spring is on the horizon! These wines are great with chicken, fish, and vegetarian meals. I also like these wine varieties with spicier cuisine, as their lower alcohol and sweetness complement the spice well. Do not let all of the words on the front of the label scare you. These are worth picking up and giving a try! If you are opting for wine and movie, these are also easy wines to enjoy on their own. Finally, the reds. For Valentine’s Day, I like to keep red wine selections to something “simply enjoyable.” While Cabernets often open up conversation about the wine, I find that Syrahs offer a lighter environment. These are bold, sometimes epically raspberry-flavored red wines. Typically, Syrahs have a softer mouthfeel than their Cabernet cousins. Depending on where the grapes were grown, you may even find one with hints of chocolate flavor. If you like lighter bodied red wines, I’d suggest a Pinot Noir. Pinot Noir from New Zealand is usually vibrant, but offers fresh cherry and plum flavors that are delightful. As Pinot Noir comes in a wide range of styles and flavors, you can also opt for one from California. Many find the slightly bigger and oakier Pinot Noir wines from Russian River Valley absolutely “yummy.” These usually come with a higher price point, but they are crowd pleasing wines that are very easy to drink. Would you like more wine suggestions? Please come see my list of wines on Instagram. I love posting wines that I try, and I hope you’ll try a few I’ve tasted as well.